Incredible. First, that in the early 19th century people were so selective of the cuts of beef that butchers would discard whole pieces of meat on the street, and second that pigs were fattened on the kitchen waste on the streets. I am reading the new book, In Meat We Trust by Maureen Ogle, and was surprised to read the excerpts from Cobbett, 1818, which led me to find images and comments by several other foreign visitors, including a humorous one by Charles Dickens, on the roaming pigs. Cobbett, 1818. 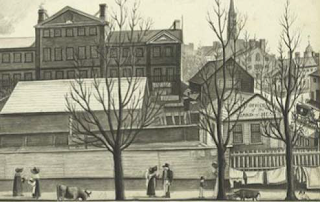 "In the course of the year hundreds of calves' heads, large bits and whole joints of meat, are left on the shambles [street with butchers shops], at New York, for any body to take away that will. They generally fall to the share of the street hogs, a thousand or two of which are constantly fatting in New York on the meat and fish flung out of the houses." 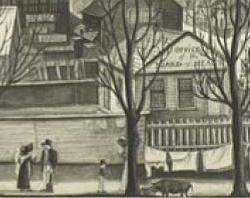 "The things that most struck me on my first walks in the city…the custom of smoking segars in the streets, (even followed by some of the children) and the number and nuisance of the pigs permitted to be at large … In the city of New York, on a moderate calculation, several thousand pigs are suffered to roam about the streets, to the disgrace of the corporation and danger of passengers. A law was passed, prohibiting their being at large after January, 1818, but before it went into operation, it was repealed." "The streets are not so cleanly swept as they should be; the reason for which is, that it is left to each housekeeper to sweep before his own door, instead of sweepers being appointed by the corporation. Pigs are suffered to run at large, a thing of which many of the inhabitants are ashamed, but which the greater part contend for as contributory to the healthiness of the city! The animal and vegetable matter thrown into the streets would, it is contended, putrify and taint the air, were it not for the pigs. But what a beastly idea is it, that the people are so lazy or dirty, as to use pigs for scavengers! ...The prohibition to keep pigs in London and Bristol is approved by the inhabitants at large." "New York has been mentioned by some writers as a dirty city : But when I was there, it struck me as being perfectly clean; I observed no sort of nuisance within its boundaries, excepting pigs, which are improperly suffered to partake of the liberty of their masters and to go at large." Charles Dickens, 1842. "Once more in Broadway! … We are going to cross here. Take care of the pigs. Two portly sows are trotting up behind this carriage, and a select party of half-a-dozen gentlemen hogs have just now turned the corner. Here is a solitary swine lounging homeward by himself. …He leaves his lodgings every morning at a certain hour, throws himself upon tin town, gets through his day in some manner quite satisfactory to himself, and regularly appears at the door of his own house again at night… Every pig knows where he lives, much better than anybody could tell him. At this hour, just as evening is closing in, you will see them roaming towards bed by scores, eating their way to the last. Occasionally some youth among them, who has over-eaten himself, or has been much worried by dogs, trots shrinkingly homeward, like a prodigal son: but this is a rare case: perfect self-possession and self-reliance, and immovable composure, being their foremost attributes." 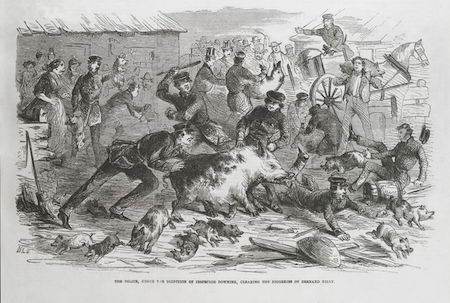 Frank Leslie´s Illustrated Newspaper on August 13, 1859 shows police clearing out the piggeries. Pigs were there to eat the garbage. System finally changed in NYC in the late 19th century when they came up with human garbage collectors.